Synopsis: Just back from maternity leave, Ruth is finding it difficult to juggle motherhood and work. The presence of DCI Harry Nelson—the married father of her daughter, Kate—does not help. The bones, skeletons of six men with their arms bound, turn out to be about seventy years old, which leads Nelson and Ruth to the war years, a desperate time on this stretch of coastland. Home Guard veteran Archie Whitcliffe reveals the existence of a secret the old soldiers have vowed to protect with their lives. But then Archie is killed and a German journalist arrives, asking questions about Operation Lucifer, a plan to stop a German invasion, and a possible British war crime. What was Operation Lucifer? And who is prepared to kill to keep its secret? Review: This is the 3rd book in the Ruth Galloway series. 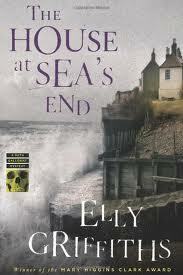 Set in the mysterious little town of Norfolk, England where the sea is reclaiming land through erosion. There were rumors that Germans had invaded England but no one ever found evidence until now. The bodies of six German men have been found buried in the sand just below the house at seas end. Ruth is called in to try to identify the bodies. This book really waffles back and forth between the struggle to be a career woman and a mother as well as the mystery of who is buried in the sand and how they got there. Struggling to find a balance to her new life Ruth does not feel very confident in her ability as a single mother. Her ability as a forensic anthropologist isn't in question. She finds herself in a quandary about whether to leave her new daughter with sitters while she goes to work or remove herself from police work and focus on her daughter. The fact that the father of her child is the married DCI Nelson doesn't help her situation. This book moves at a fast pace although I'm not sure I loved it. I actually found Ruth's struggle with new motherhood a bit more fascinating than the murder mystery which seemed to lack something. I'm also starting to think that while Ruth is a brilliant woman she is a bit lacking in common sense. She often finds herself in vulnerable situations that she is baffled how she got into. I am however intrigued by the druid Cathbad who seems to turn up at the most opportune times and always seems to know everyone's secrets. I would love to learn more about this character and I hope that he continues to show up throughout this series. The Ruth Galloway series in my opinion is a fun series but not riveting, but for those who enjoy a mystery without the blood and guts of many thrillers this might be a series for you.